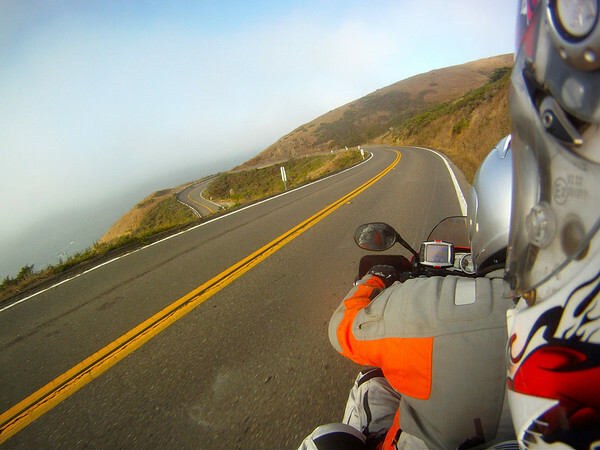 I shot this photo on Route 1 in California with my GoPro during the final riding day of our road trip in September 2011. It’s a little bit of a different point of view for me. One I’m not all that fond of. Let me gues….. You don’t like the view riding pillion? I used to love it until I started riding mown bike, now I don’t really feel comfy on the back. Nothing to hold onto, no heated grips, etc. Hoping it was something simple…like a flat tire, and not a crash or blown engine. I think those are about the only reasons that would convince me to ride as passenger. I don’t know why I never asked more about this part of the journey, looks like i’ll be hearing about it soon! Because you hate me and you want to steal my boyfriend. That’s why. LOL, thats ok believe me I don’t want to ride 2up with kenny! Now sidecar racing the Isle of Mann……..
That certainly is a different view for you. There’s got to be a story behind it!